Dependent types are a wonderful way to construct correct functional programming and specify interfaces as Edwin has shown in his nice book on type driven development using a welsh dragon. But shall we go further in the esoteric world of homotopy type theory? I will try to motivate this and I am looking forward to some discussions with people who have a more pragmatic attitude to dependent types. The increasing complexity of codes with the growing number of cores that should be utilised make such codes hard to optimise and maintain. In this talk, we present the OpenMP and MPI refactoring implemented in the ParaFormance tool. This tool transforms the sequential code into parallel code able to run on shared memory machines. Further refactoring is implemented to adapt the source code to exploit a larger number of processors on large HPC clusters with message passing support. In addition, the resulting MPI code can be used by developers as a starting point for further optimisation. Both refactorings are preceded by an advanced safety checking which reports concurrency problems and gives hints and suggestions on how to fix them. The protocols that describe the interactions between IP Cores on System-on-a-Chip (SoC) architectures are well-documented. These protocols described not only the structural properties of the physical interfaces but also the behaviour of the emanating signals. However, there is a disconnect between the design of SoC architectures, their formal description, and the verification of their implementation in known hardware description languages. Within the Border Patrol project we are investigating how to capture and reason about the structural and behavioural properties of SoC architectures using state-of-the-art advances in programming language research. Namely, we are investigating using dependent types and session types to capture and reason about hardware communication. the validity of the specified connections made between components. We provide these guarantees through the (ab)use of dependent types as presented in Idris; and abuse of indexed monads to reason about resource usage. Given time I will give an account of how this language enables reasoning about SoC behaviour when considered in conjunction with Session Types.ssion Types. The analysis of structure in three-dimensional images is increasingly valuable for biomedical research and computational science. At the same time, the computational burden of processing images is increasing as devices produce images of higher resolution (e.g., typical CT scans have gone from 128^3 to roughly 512^3 resolutions). With the latest scanning technologies, it is also more common for the the values measured at each sample to be multi-dimensional rather than a single scalar, which further complicates implementing mathematically correct methods. Diderot is a domain-specific language (DSL) for programming advanced 3D image visualization and analysis algorithms. These algorithms, such as volume rendering, fiber tractography, and particle systems, are naturally defined as computations over continuous tensor fields that are reconstructed from the discrete image data. Diderot combines a high-level mathematical programming notation based on tensor calculus with an abstract bulk-synchronous parallelism model. Diderot is designed to both enable rapid prototyping of new image analysis algorithms and high performance on a range of parallel platforms. In this talk, I will give an overview of the design of Diderot and examples of its use. I will then describe aspects of its implementation with a focus on how we translate the notation of tensor calculus to efficient code. I will also briefly discuss the automated techniques we use to validate the correctness of the compilation process. Diderot is joint work with Gordon Kindlmann, Charisee Chiw, Lamont Samuels, and Nick Seltzer. John Reppy is a Professor of Computer Science and a Senior Fellow of the Computation Institute at the University of Chicago. He received his Ph.D. from Cornell University in 1992 and spent the first eleven years of his career at Bell Labs in Murray Hill NJ. He has been exploring issues in language design and implementation since the late 1980’s, with a focus on higher-order, typed, functional languages. His work includes the invention of Concurrent ML and work on combining object-oriented and functional language features. His current research is on high-level languages for parallel programming, including the Diderot, Manticore, and Nessie projects. Congratulations to Matus Tejiscak, who successfully defended his thesis yesterday. 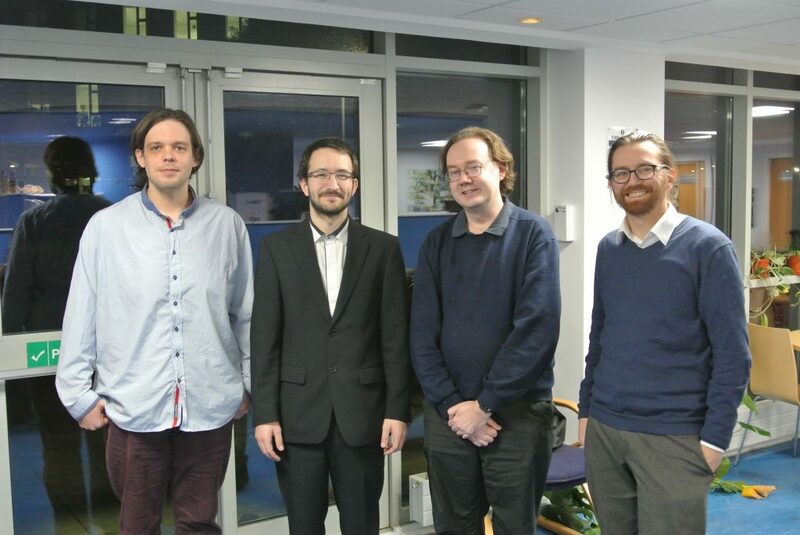 He is pictured with supervisor Dr Edwin Brady, Internal examiner Dr Chris Jefferson and external examiner Dr Andreas Abel, from the University of Gothenburg. Formal languages and automata are taught to every computer science student. However, the student will most likely not see the beautiful coalgebraic foundations, which use coindutive reasoning. In this talk, I recapitulate how infinite tries can represent formal languages (sets of strings). I explain Agda’s coinduction mechanism based on copatterns and sized types demonstrate that it allows an elegant representation of the usual language constructions like union, concatenation, and Kleene star, with the help of Brzozowski derivatives.